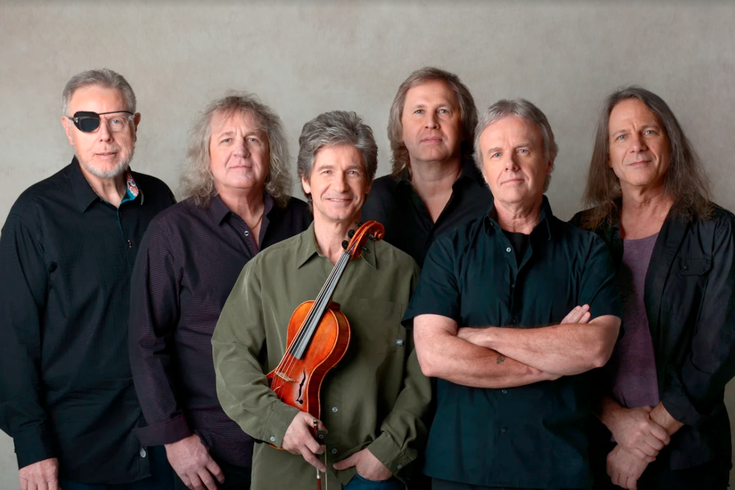 Kansas brings its unique blend of intricate arrangements rooted in American influences to the Borgata in Atlantic City on March 9. From across the pond to north of the border to America's heartland, progressive rock bands have been well-received in the Philadelphia area. While bands such as Rush and Genesis appear to be on permanent hiatus, others – from Yes to Jethro Tull to Supertramp – are still in the game. Another is Kansas, which will be bringing its unique blend of intricate arrangements rooted in American influences to the Borgata in Atlantic City March 9. Current lead singer and keyboardist Ronnie Platt, a Chicago native who joined the band in 2014 after original singer Steve Walsh announced his retirement, expects many of the same core fans from the Delaware Valley to be in the house. "I know Philly is a huge Kansas town," said Platt. "It only makes perfect sense that a band named Kansas would go over great in Philadelphia, right?" In terms of making the show ideal for longtime fans of not only the band's beloved deep cuts but its best-known classic tracks – "Carry on Wayward Son," "Dust In The Wind" and "Point Of Know Return," etc. -- Platt is relieved his status as a relative newcomer leaves him out of piecing together a set list that also includes tracks from the 2016 album, "The Prelude Implicit" on the German label Inside Out Music. "They could never put the responsibility of putting the set list on me," said Platt. "The show would be five hours long, it really would be." The responsibility largely falls on drummer Phil Erhart and guitarist Rich Williams, each of whom have played on every one of the bands 15 studio albums, and bassist Billy Greer, who has been with Kansas since 1985. The current lineup is rounded out by violinist David Ragsdale, guitarist Zak Rizvi and keyboardist David Manion. Walsh was the voice on the band's classic hits, but left in 1982 and was replaced by John Elefante, but Walsh returned again in 1985. When he retired in 2014, Elefante briefly considered a return but decided against it. That opened the door for Platt's own Rocky Balboa story. Mostly known for fronting high-end cover bands in Chicago, and for a stint in the recording/touring act Shooting Star, he was selected to join a band he literally worshipped. Next came a whirlwind tour and the chance to write the lyrics for "The Prelude Implicit" (as well as material for another release in the works). Although it has been since 2014, the first real breather has provided a chance to reflect. "I can't believe I'm approaching four years here, and how quickly three and a half years have gone by," he said. "Things have moved so quickly that I still haven't had a chance to digest this." The depth of the music, the intensity of the music – it's amazing. It only goes to show how political things are." Platt only wrote for his own gratification before getting asked to help write original material for Kansas. "That's an aspect of the band I never expected when I got the job," said Platt, who also chips in on keyboards. "It's not like Kansas doesn't already have an enormous library of music to fall back on. It was pretty exciting for me to have my voice on a studio album of new Kansas music, but to also have a hand in writing. It's been beyond my wildest dreams." While a new citizen in the Kansas Nation, Platt feels a sense of loyalty and struggles with why the band remains off the radar of the Rock and Roll Hall of Fame, despite producing two of the widely accepted biggest classic rock songs of all-time in "Carry On Wayward Son" and "Dust In The Wind" (both penned by legendary founding member Kerry Livgren, who stopped working with Kansas due to a stroke in 2009). Despite an apparent bias against progressive rock acts, there has been a recent breakthrough after Pink Floyd held down the fort for the genre from 1996 until the induction of Genesis in 2010. Rush followed in 2013, Yes in 2017 and now, The Moody Blues, in 2018. Could Kansas be next? According to Platt, it's a no-brainer. "The biggest thing is the influence Kansas has been on other musicians," he said. "I know Kansas inspired me, and I'm sure it's the case, a million times over. "The depth of the music, the intensity of the music – it's amazing. It only goes to show how political things are. Maybe the tide is turning to where it should go, but I'm not going to hold my breath. We're so concerned about what we have to do to spend any time worrying about that." What Kansas can worry about is playing at – or above – the level that made them Philly-area favorites when they first hit the scene in 1973. "We can't wait to get to the Borgata," said Platt. "After this break, we're all itching to get out there and just play."